Hello again! I've been a bit under the weather this week and haven't had much to write about. Today (Thursday) is the opening of the Mussoorie Writers' Mountain Festival. Wonderful sessions all day Friday and Saturday! My long-time readers know this is one of the regular events here that I look forward to. I'll be photographing and blogging about the writers, movies and other presentations. 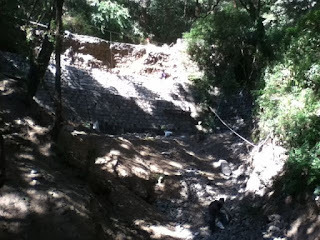 I do have one photo for you -- taken from the path below the pushta being built just below the New Road. The man at the bottom of the picture was putting rocks into a bag, then carrying them up to the wall workers near the top. The distance between the new wall and the broken road is quite wide; when they are done the road will be back to a good width, instead of its current narrow lane marked off by boulders.